By definition, a natural disaster is a force of nature that has a significant impact on a human population. The tremendous damage to farms and farm products that have resulted from recent storms Hurricane Irene and Tropical Storm Lee are, in this sense, natural disasters of large proportions. In New York State alone, Governor Andrew Cuomo estimates more than $45 million in agricultural damages from Irene. The toll of farm and food dollars lost will continue to add up over the coming months. However, what is immediately clear from the recent flooding is the role human choices have had in affecting the scale of a natural disasters as our farmland has turned over to development. Farmland is of value to local populations beyond the food and fiber it provides. It helps to absorb and filter water, an indispensable characteristic in mitigating the impact of flooding and other results of a natural disaster. Unfortunately, these valuable benefits are often not missed until they are gone and – as is the case with Irene – lost attributes with disastrous consequences. The rainfall and flooding from Irene was unprecedented in much of the Northeast. What appears an anomaly for the region may be the result of our changing landscape. The farms and forests that were once located upstream from populated areas have been and are continuing to be turned over to development. This conversion of farmland that has occurred throughout the United States—more than 23 million acres nationwide between 1982 and 2007—takes agricultural land away from its vital role in water control. In fact, the top five states that have developed the largest percentage of their agricultural land are among the states located in the path of Irene – New Jersey (26.8 percent), Rhode Island (22.5 percent), Massachusetts (18.1 percent), Delaware (14.3 percent), and New Hampshire (13.2 percent). What results, as Irene and Tropical Storm Lee have so dramatically highlighted, is the impact of water and flood control once the natural “sponge” of farm and forestlands has been paved over. Farmland also provides a cost-effective water management infrastructure. With a nation increasingly attuned to belt-tightening, it is more essential than ever that the value of farmland for controlling water is fully recognized. Rain and flood water drenched farm fields and strong winds flattened crops throughout the path of Irene. Farms along the East Coast have major damage, losing crops because of water, having crops covered by new silt, and fields being flooded by contaminated water. Throughout the Mid-Atlantic region, damage to crops will mean greater uncertainty as farmers move into the harvest season. 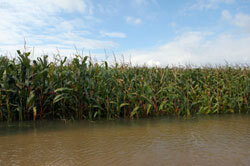 What is in the water that has submerged farm fields is also of concern. Foods that have survived once flood waters receded have been deemed unsafe for human consumption by the FDA. We would be remiss to let an eye-opening experience presented by Irene to pass by without considering an improved vision for the future. Through programs and a supportive marketplace, we must incorporate the value that farmers provide, not just in feeding the population but in quelling a natural disaster. Fortunately, many of the states recently affected by Irene and Lee have already recognized the value of farmland protection, including Delaware, Maryland, and Vermont that have each saved more than one acre for each acre of agricultural land developed. Most recently, New Jersey’s Governor Christie approved legislation providing $90.6 million in grant funding for farmland protection efforts in the state. We must continue to think about what happens next, in both regional and national contexts, to keep farmland protected and our farms and homes safer from the coming storms. This entry was posted in Conservation, Farmland Protection, In the News and tagged Farmland Protection, flood, Governor Christie, Governor Cuomo, Hurrican Irene, Tropical Storm Lee on September 9, 2011 by Bob Wagner. WE need our forests and trees! Here in Tx we have a drought and some say it’s partly because when trees are cleared, the water they held in the soil evaporates and everything dries up. And when it does rain, we have flash floods. I wonder if the dust bowl of the 30’s was related to something we did to the land and soil.